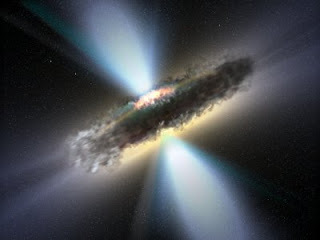 In general a black hole is a region of space where the gravity is so high that the fabric of space and time has curved back on itself, taking the exit doors with it. If one wanted to escape the gravitational pull of a planet it must leave the planet's surface with a certain velocity, this is called the escape velocity. On Earth this value is about 25,000 mph. With a black hole the escape velocity is greater than the velocity of light, and since nothing travels faster than light, no object can escape its pull. Research by the American physicist John A. Wheeler helped to predict what a black hole would do to its surroundings. The exact boundary between where light can and can't escape has been termed the "event horizon." Conventionally the size of a black hole is determined by the size of the event horizon, which is a clean quantity to measure and calculate. Everything within the event horizon is collapsed to an infinitesimal point at the center of a black hole. This point is known as a singularity. The way that black holes are formed is related to the life cycle of a star, so this will be discussed first. Stars are formed when a large amount of gas (mostly hydrogen) starts to collapse in on themselves due to gravity. As it collapses the gas molecules collide more and more and heat up. Eventually the gases become so hot that instead of bouncing off one another they will instead fuse and the hydrogen atoms become helium atoms. All of this additional heat increases the pressure of the gas until it's sufficient to balance the gravitational attraction, and the gas stops contracting. However, eventually a star runs out of its hydrogen and other nuclear fuels. More massive stars will run out of fuels sooner because they need to be hotter in order to balance the gravitational attraction. When a star runs out of fuel it will begin to cool down and thus contract. As the star contracts the gravitational field at its surface gets stronger and its light cones get bent inward more. Eventually, when the star shrinks to a certain radius the gravitational field becomes so strong that the light cones are bent inward and light can no longer escape. According to the theory of relativity, nothing can travel faster than light, so if light cannot escape, neither can anything else, this gives us the region known as a black hole. However, a black hole doesn't form at the end of the life cycle of every star. If that were true then there would be many more black holes which would change a lot of things about our galaxy. In order for a black hole to be formed a star must achieve a critical radius, known as the Schwarzschild radius. This is the radius at which the escape velocity from the star is equal to the speed of light and can be calculated from the formula RS = 2GM/c2 . In this formula G is Newton's gravitational constant, M is the mass of the star, and c is the speed of light. Since G and c are constants it can be seen that the determining factor of whether or not a star becomes a black hole is its mass. If a star doesn't form a black hole then it will turn into either a neutron star or a black dwarf star. Does a Black Hole Ever "Die"? There are a few theories that try to describe this complicated process. Stephen Hawking hypothesized that due to quantum-mechanical effects black holes emit radiation. 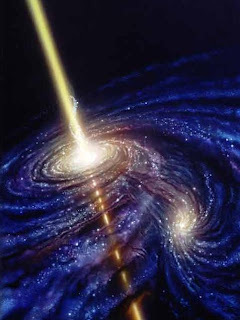 This energy emitted comes from the mass of the black hole. Therefore as energy gets emitted the mass of the black hole will decrease. Over time the black hole will radiate more and more intensely and lose mass faster and faster until theoretically it vanishes. This idea is very speculative because in order to calculate exactly what happens requires quantum-field-theoretic calculations in curved space time. This is not only very difficult to do, but it is also nearly impossible to test experimentally. One look at why black holes evaporate is that according to the uncertainty principle of quantum mechanics it's possible for the law of conservation of energy to be briefly violated. This means that the universe will be able to produce mass and energy from nothing, but only if they disappear soon after their creation. One such example is called a vacuum fluctuation. This is w hen pairs of particles and antiparticles appear out of nowhere, but soon annihilate one another. Surprisingly, it has been confirmed that vacuum fluctuations actually do exist. If this fluctuation occurred near the event horizon of a black hole and one particle was sucked in, but the other wasn't then the other particle would appear to be emitted. As these particles get emitted continuously over time they appear as radiation given off. This yields a similar result to that of Stephen Hawking's hypothesis in that black holes are constantly emitting radiation and his saying that "Black holes ain't so black." Black holes all look different from one another, but this is mainly due to the difference in their surroundings. All black holes are identical except for three major characteristics: mass, spin, and electric charge. Black holes erase all other properties of the objects that they swallow. The mass of a black hole is determined by studying the material surrounding them. There have been three categories established for different size black holes; stellar-mass, which is 5-100 times more massive than our sun, midmass, which 500-1000 times more massive than our sun, and supermassive which could be a million times more massive than our sun or even more. Black holes can rotate about an axis, but there is a limit to their rotational speed. A rotating, uncharged, black hole is described by the Kerr soultion to Einstein's equation for the gravitational field. This equation calculates a maximum angular momentum for the black hole. This formula is given as: Jmax <>2G/c. With this angular momentum a maximum angular speed can be calculated. However spatial extent must be considered in these calculations because most stars have a majority of their mass concentrated at their centers. These calculations are very difficult and won't be covered in this blog because of their complexity. How do we know they exist? locate these objects? Also if no light escapes a black hole then how could one be seen? In order to answer these questions we must try to observe black holes in an indirect manner. One place black holes are usually found is at the center of a galaxy, such as the one found at the center our galaxy Sagittarius A*. 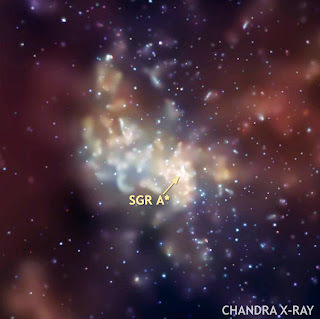 Black holes are usually discovered by satellites that measure X-ray radiation. As matter falls closer and closer to the event horizon it gets hotter and hotter, emitting more heat. This heat gives off large amounts of X-ray radiation. Satellites today such as the Chandra satellite are able to detect these X-rays given off by the objects circling the event horizon. Hawking, Stephen W. The Illustrated A Brief History of Time. New York: Bantam, 1996. A House Made of Soybeans? Green Tea: The Miracle Tea? Top Ten Roller Coasters: What makes them great? Are Cell Phones Linked to Brain Cancer?